When referring to coordination as a leadership skill, we must qualify that for the Church it means more than getting people to outwardly conform and work together as a unit. Rather, we’re coming together in true unity — the kind of coordination that showcases Christ. 1) Coordination in the Church aligns with God’s eternal intent to “bring unity to all things in heaven and earth under Christ” (Eph. 1:8-10). A united Church showcases a triune God. Jesus prayed, “that all of them may be one, Father, just as you are in me and I am in you. May they also be in us so that the world may believe that you have sent me. … I in them and you in me – so that they may be brought to complete unity. Then the world will know that you sent me and have loved them even as you have loved me.” (Jn. 17:21-23) The “complete unity” Jesus prayed about gets beyond merely tolerating one another or outward conformity to the very essence of who we are … as Jesus and the Father are one. Coordination that showcases Christ brings us together on the basis of who we are in Him, fulfilling His purposes, not our own. All our various programs in the Church work toward this end rather than taking on a life of their own that bears no resemblance to the whole. 2) Coordination portrays a Church that is about Him, as “God placed all things under his feet and appointed him to be head over everything for the church” (Eph. 1:22-23). When it’s about Him, and not us, coordination becomes about showcasing Christ so people see in “his Body, the fullness of him who fills everything in every way” (Eph. 1:23). Our light shines brighter when each of our individual flames come together as a coordinated whole. 3) Coordination demonstrates how Jesus destroys barriers and walls of hostility, “thus making peace” by bringing together diverse people and making it so that “in him the whole building is joined together and rises to become a holy temple in the Lord. … built together to become a dwelling in which God lives by his Spirit” (Eph. 2:14-24). Life in Christ is not intended to be done in isolation as we are “no longer foreigners and strangers, but fellow citizens with God’s people and also members of his household” (Eph. 2:19). God’s Word emphasizes how we, as His Church, are “joined together” and “built together” to more fully showcase Him. Coordination then, isn’t about micromanaging but about more fully living as His holy temple by His Spirit. 4) Coordination fulfills God intent that “through the church, the manifold wisdom of God should be made known to the rulers and authorities in the heavenly realms, according to his eternal purpose which he accomplished in Christ Jesus our Lord” (Eph. 3:10-11). God knew what He was doing in bringing not only diverse but hostile groups of people together to be one, His Body. When we live together in a coordinated fashion, we show even the spiritual powers how wise God is for we are so much better and do so much more eternal good together than alone. 5) Coordination that gets beyond mere outward conformity to true unity grows out of “being rooted and established in love” and pulls on His power (Eph. 4:16-21). We can’t do this on our own but rather need His strength and need to grasp “how wide and long and high and deep is the love of Christ” in order “to know this love that surpasses knowledge – that you may be filled to the measure of all the fullness of God” (Eph. 3:18-19). 6) Coordination is part of making “every effort to keep the unity of the Spirit through the bond of peace” (Eph. 4:3) so that we “live a life worthy of the calling you have received” (Eph. 4:1). Part of that effort requires that we “Be completely humble and gentle; be patient, bearing with one another in love” (Eph. 4:2). Coordination that truly demonstrates our unity in Christ isn’t born through coercion or manipulation but through cooperation, consideration, and concern for one another. When we focus on our differences it’s hard to come together. But, when we look at all we have in common in Christ Jesus, that far outweighs our personal agendas and preferences. 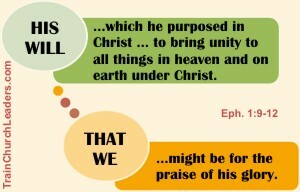 8) Coordination that exemplifies true unity doesn’t come naturally but takes the equipping of His people “so that the body of Christ may be built up until we all reach unity in the faith and in the knowledge of the Son of God and become mature, attaining to the whole measure of the fullness of Christ” (Eph. 4:11-13). Leaders must intentionally work toward the coordination of the Body but must also help the Body understand the way God designed the Body to function so they as more likely to both see and do their parts for the greater good and not merely for self-fulfillment. 9) Coordination doesn’t minimize the individual but rather supports and enhances each member or group within the Body as from Christ “the whole body, joined and held together by every supporting ligament, grows and builds itself up in love, as each part does its work” (Eph. 4:15-16). Often people shy away from the idea of coordination thinking it puts a straight-jacket on people, stifling creativity and freedom. The kind of coordination that showcases Christ does the opposite. Because we have a support system, we have more potential, not less. 10) Coordination that demonstrates our true unity in Christ happens as we “put on the new self, created to be like God in true righteousness and holiness” (Eph. 4:18-32). We need to put off the old self, our former way of life as lived in the world, because those ways are “corrupted by its deceitful desires” (Eph. 4:22). Otherwise, we might find ourselves pushing our own agendas and personal preferences rather than Christ’s and justifying our anger and bitterness when people don’t conform. We need to function from the position of who we are in Christ, so we operate from a place of truth and love, able to bear with and forgive one another “just as in Christ God forgave you” (Eph. 4:32). Then we will say and do that which builds up and unifies rather than tears down and divides.